Sariska National Park or Sariska Tiger Reserve was first declared a wildlife reserve in 1955, the park is a 866km sq area situated about 107km from Jaipur. Many of these species present here are protected; the park offers opportunities to see them, and perhaps the highlight of any visit, the Bengal tiger. Besides tiger Sariska is home to many carnivores including Jackal, Leopard, Wild Dog and Hyena. Herbivores such as Spotted Deer, Sambar, Blue Bull, Wild Boar and Chinkara, monkeys, reptiles and many varieties of birds are seen and found in large number in the park. Ancient temple ruins of Garh-Rajor belonging to 10th and 11th centuries are present in middle of Sariska Wildlife Sanctuary. 18 Kms from the entrance gate of Sariska Tiger Reserve, on a hillock lies 17th century jungle fortress, Kankwari Fort. Dara Shikoh had been imprisoned by his brother Mughal king Aurangzeb during struggle for succession of the throne. Visit the reserve in the early mornings to spot the tiger as well other wild life present here. Private vehicles are not allowed inside the park. Tourist can take a tour of park in SUVs run by the park. Though private vehicles are allowed to enter park on Tuesdays & Satardays, it is only to visit famous Hanuman temple at Pandupol. 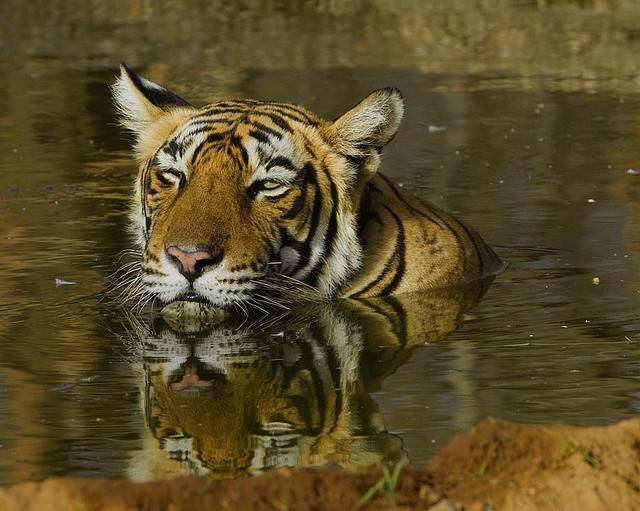 Sariska Tiger Reserve is about 200 KMs from Delhi and is the nearest tiger reserve from Indian capital.